That being that I was watching a bunch of tiny home videos yesterday, as I’m wont to do every so often. I find them so inspiring – so much you can do in small (or small-ish) places! It will be, however, a small home series. Probably not starters, since I don’t want to limit my creativity too much. 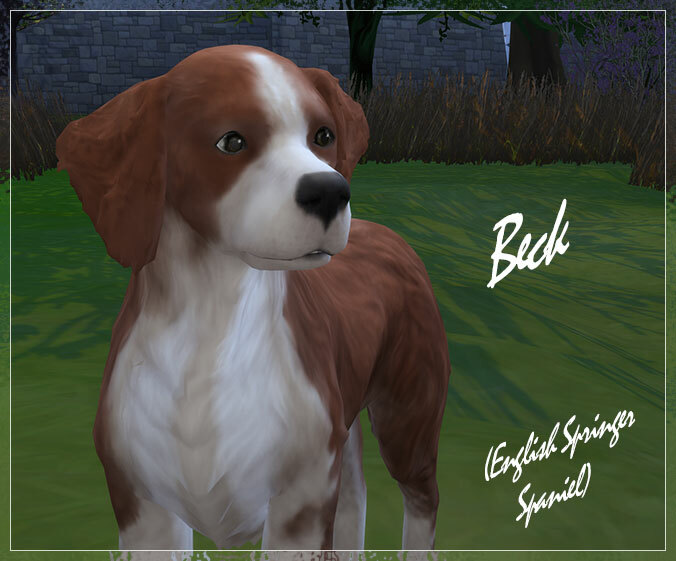 😉 But I think I’ll build them on the 20×15 lots in Newcrest so that anyone who may want to use them can put them on any sized lot without troubles and expand as needed from there. AND SO: Here’s the plan. I’m going to build a two-bedroom home with a good, playable layout. Before I do any finishing on the inside or outside, I’ll save that base. Then I’ll take that base and create a bunch of different house styles with it. So one home would be modern, one would be Victorian, one would be a cabin and one would be a Tudor home. See where I’m going with this? Ha! Too much fun, right? Another sim and house are currently underway in my Peace River save! Also, the first pet makes their way into the town. 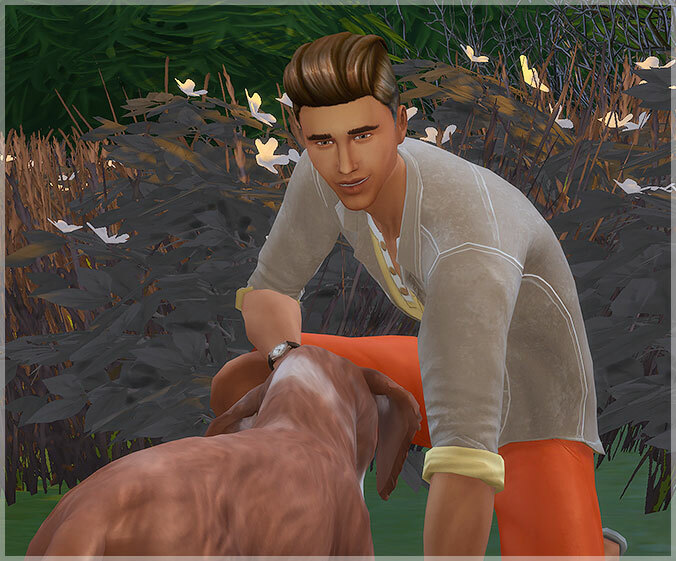 Meet Brandon Fallon and his dog, Beck. The home he purchased is Peace’s Bedlington Boathouse and it’s placed just where the original is in Brindleton Bay. It looks just as traditional on the outside as the other homes in the Bay area, but Brandon prefers a more modern ambiance, so he has really re-done the interior to his liking. There are a couple of rooms upstairs that will be left unfinished for now. Never know what life will bring, right? As you can see, Gramps has indeed indulged Renee with her dreams for her room. Yes, an explosion of colour! After all, she is 10 years old. 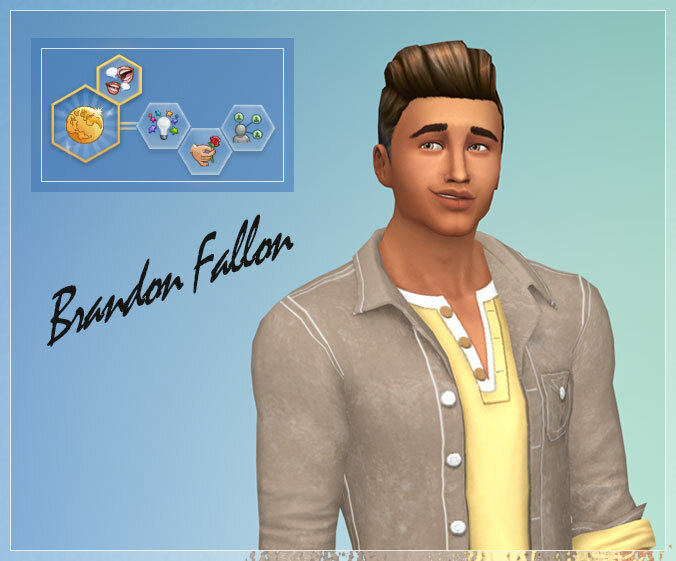 😉 And truth be told… This all happened one weekend when Bob and Vanessa were away in Granite Falls to gather rare herbs for Vanessa’s cooking. Yup. Ol’ Melvin kinda snuck in under their noses and Renee had the time of her life shopping for and re-doing her bedroom! And he had the time of his life spending more of his left-over money! Bob had to bite his tongue for about a week. Vanessa was more quickly forgiving of her dad. Eventually, Bob came ’round to seeing that it was what made Melvin happy and it certainly had made his daughter’s eyes shine to show off her new “creation”. He did have coffee with Gramps early one morning and explain that too much indulgence wasn’t a good thing. Gramps agreed. Then he went out and bought a fancy pink journal for Renee two days later. Most of the CC is Peacemaker’s. The parquet floors are by the lovely … whoops! … Can’t say, cuz she doesn’t have them up on her tumblr yet. 😛 The carpet in the living room and master bedroom is my own and the carpet in Renee’s room is on MTS by mustluvcats. Back to Brindleton Bay we go! I’ve finished the second house so it is time to introduce the family who is living there. 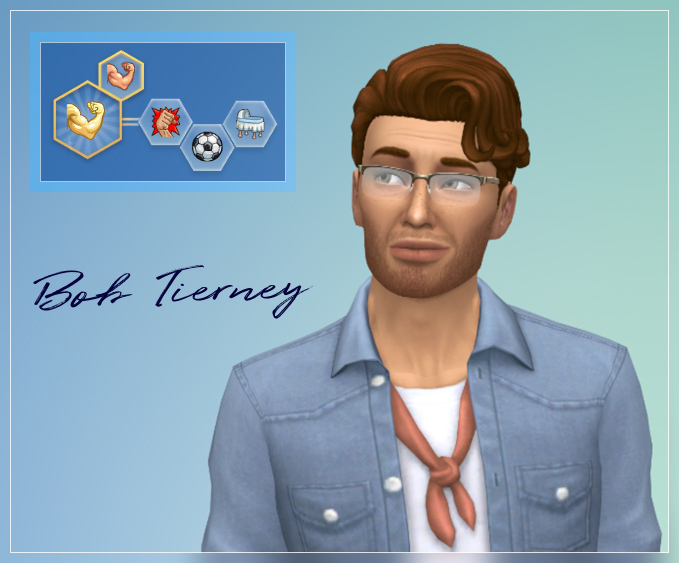 Bob is Chloe Tierney’s brother. A bit older than Chloe and a bit of a jock. They’re kind of opposite, these siblings: she’s artsy-fartsy and he’s just… fartsy. You know. As guys do. That smug look on his face? Yeah. He’s a bit on the self-confident side. Hopefully that will help and not hinder with his athletic career. He won’t mind working up a good sweat while working out, either. But he’s definitely a family man and his wife and little girl are the apples of his eye. 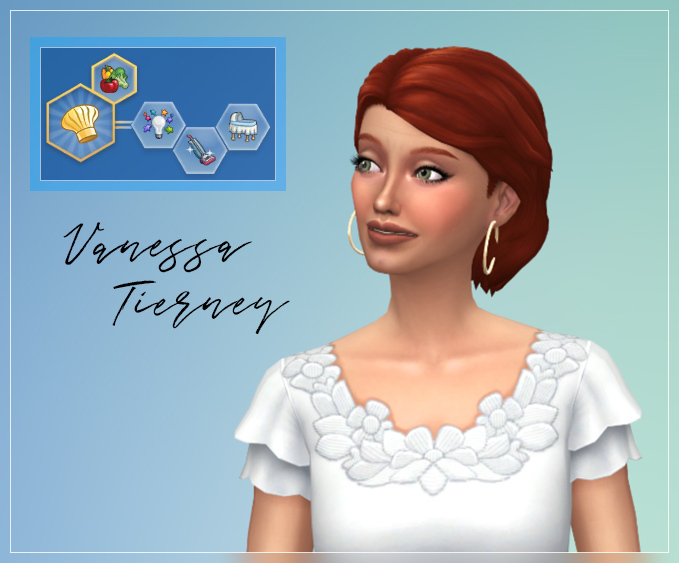 Vanessa is Bob’s wife. She’s creative, rather like her sister-in-law, but not with paint – with food! (Bob doesn’t mind that bit at all, btw.) She wants to become a master chef, but she’s also family and home oriented. Renee is Bob and Vanessa’s only child. She has definitely inherited the creative trait from both sides of the family. She wants to be a famous painter one day. But she’s only 10yo, so there’s a lot of life to be lived and a lot of things to learn before deciding on that final career! Yup, she’s 10yo and an only child. Truth be told, Vanessa was horrified by the whole childbirth thing and is really reluctant to get pregnant again. Bob would like to have more kids, though, and Vanessa’s not opposed to kids, just childbirth! LOL They have talked about adoption once or twice. 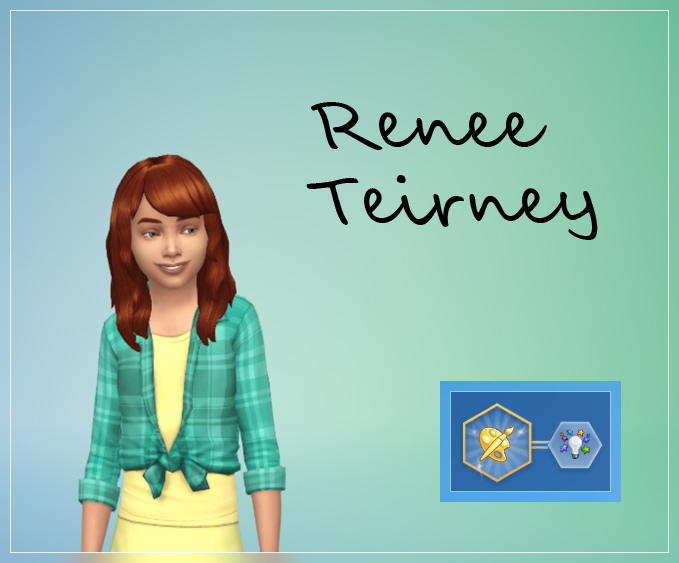 Maybe that will be the only way Renee will get a little brother or sister? 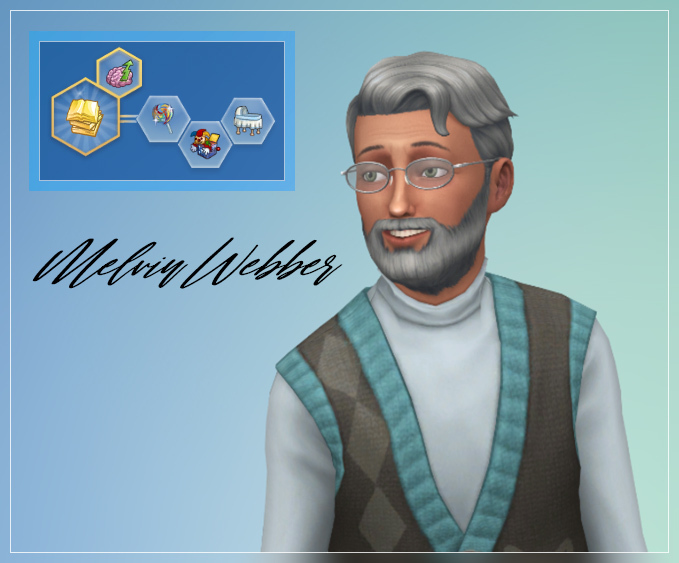 And finally, Vanessa’s dad, Melvin Webber. Or as Renee likes to call him, “Gramps”. His wife, Charlene, passed away years ago, just after Renee was born. Poor Melvin was so lonely and started to not take care of himself very well, so Vanessa and Bob insisted he move in with them. Hope you’ve enjoyed meeting this family! I love writing about the people I’m creating to live in this town. It really helps to round out their characters and makes me eager to play them all!